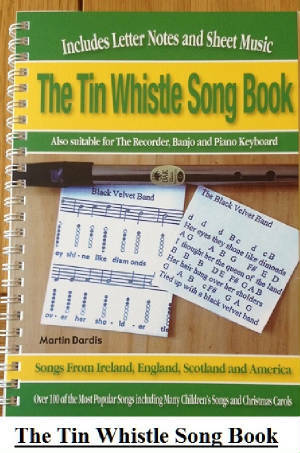 Dirty Old Town sheet music and tin whistle notes in the key of D Major and E. written by Ewan McColl and recorded by The Pogues, also by The Dubliners. The letter music notes are included. If you play a recorder in the key of D then the same notes will work for you. I have also included the easy to follow keyboard / piano accordion notes. here's the easy version in letter note form. The lower case letters are the high notes. Here's another version using the standard notes found on the D' whistle. The video is yours truly playing a Susado plastic whistle, of all the one's I already tried I find this the best. Here's the notes I play, with the high notes in bold. To get the high ones just blow a bit harder. D F# A B A G B G D.
You may notice in the video that I play the high D note while leaving the hole nearest my mouth open as opposed to keeping all the holes closed. This is just my way of doing it as it helps to distinguish between the low and high Ds. It's totally up to yourself what way you want to play and given note. There are several ways of playing every note on the whistle. By the way I'm using a Susato Kildare model as I have yet to find a better whistle for the same price. They are around 25 euro. Tip - Don't try to play it all at once, learn it one line at a time. Get the first line of by heart even if it takes a hundred tries. Then learn the second line, then put the first and second parts of the tune together. Do the same with the third and forth lines and then put the whole thing together. After all there's only 4 lines in the whole song. You'll get there in the end. If you ever listened to the Pogues version of this song you may have noticed that they changed keys through the song. The first part using harmonica is played in the key of D. The verses are in the key of G, and the instrumental using the uilleann pipes is in the key of C.
above are the notes played be Jean in the videoHe decided to play it this way from listening to The Dubliners. The tone is higher than my version. Here are the piano keyboard notes. I kept this as easy as I could and used no black notes.